in the heart of Kyoto’s historic entertainment district, Gion. This traditional Maiko Dance Festival is held April 1- April 30. There are four performance daily-(12:30,14:00,15:30,16:50). The Dance performance is held at this theater in Gion. A lot of people visit here today.The weather is very good. This orange light pole shows sponsor's name of this show. so we decided to hold the event this year." wishing early restoration of stricken area. so during the time,Maiko entertain us with green tea and sweets. She makes teas for us. And left blue maiko brings us teas. These are green tea and sweets. We can bring this dish back home as souvenir. Now she is taking a break. These are theater where the performance is held. Once the show starts,taking photos is forbidden. This show is really worth seeing! This poster tells us about another Dance Festival in Gion. These kind of Maiko Dance Festivals are held everywhere in Kyoto in April. This poster tell us about Night light-up of Kodaiji-Temple. Everyone can enjoy cherry blossoms in the night. Kodaiji-Temple is very famous,it is one of popular spot in Kyoto. and a lot of interesting events are held everywhere. Oh, your pics are beatiful as always Kumiko! I wish I was there!! April is good season for you to visit Kyoto. And you must see "Miyako-Odori". 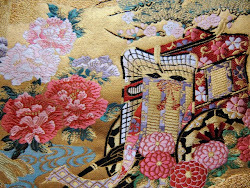 can you tell me the name of the maiko dressed in blue kimono,please? she's so beautiful. I'm very late for answer for you.I'm so sorry. I searched her name.Her name is "Takamari". Did I understood correctly that I may take photos before the performance begins? I think you can take photos during the tea ceremony before the performance starts,but you had better ask the person in charge at the theater and get a permit before the tea ceremony starts just in case. Hi there! Quick question that's entirely off topic. Do you know how to make your site mobile friendly? My web site looks weird when viewing from my iphone 4. I'm trying to find a theme or plugin that might be able to correct this problem.